After luckily winning a pair of return tickets from Kuala Lumpur to Chengdu, China last year, me and my blissfully happy Mother are going to explore the formidable country. We'll start our travel in Chengdu then move ahead to Xi'an to say hello to the terracotta warriors. Hopefully the weather will cooperate warmly with us, the patethically prepared tropical lazybones. After Xi'an, I'm thinking about the possibilty to go either to Guilin or Hong Kong or Yunnan. This is my first trip to a country whose language I do not understand and alphabets I could not read. I'm nervous, excited, anxious, joyfull... all the necessary emotions that attack you prior to your leave. My tools to survive are Lonely Planet, charming killer smile and a hope that being partly Chinese will makes the Chinese take a pity on us. 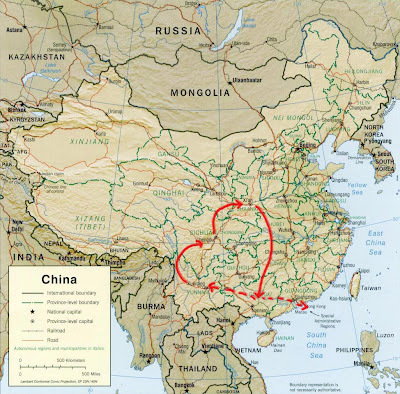 By the way, I just realized upon posting this entry that my trip is going to take a heart form shaped. Awww. Maybe I will be able to successfully pass the China trip exam after all. After this, I feel I'll be able to take over the world. Wish me luck, won't you?